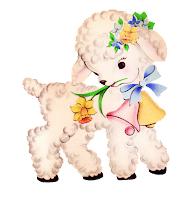 Today I would like to introduce you to Fable. 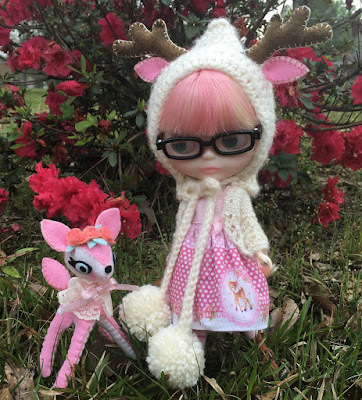 Fable is a Cherie Babette Blythe. 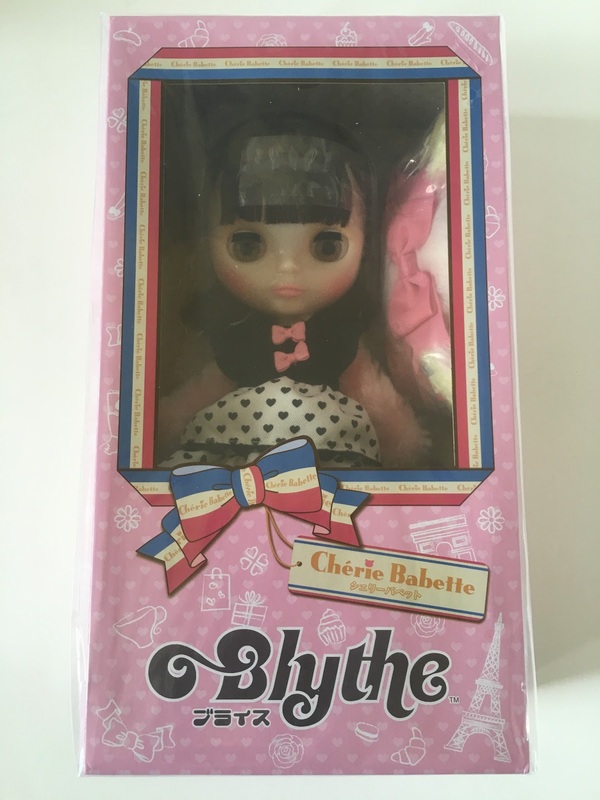 She has been with me for a few months now, so she's already had time to get settled in and become a part of our Blythe family. 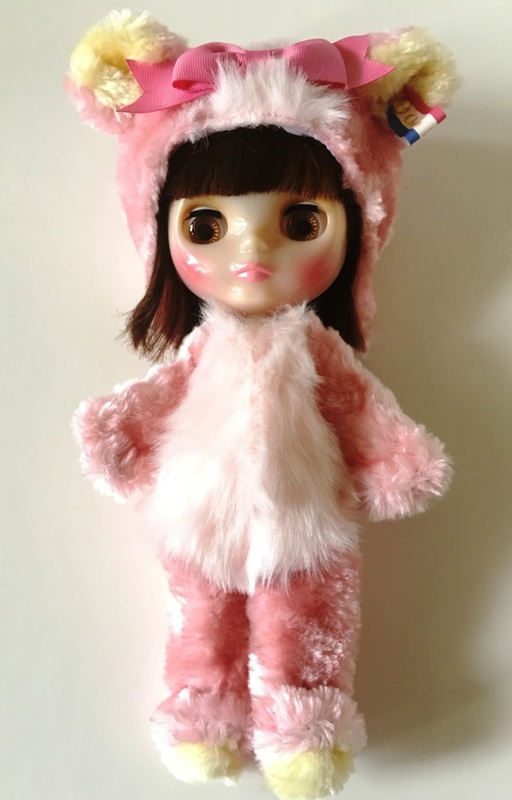 Her stock outfit is the most adorable pink fuzzy, incredibly soft bear suit! 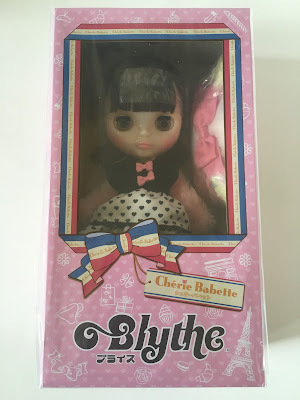 She truly is the most huggable Blythe!!! 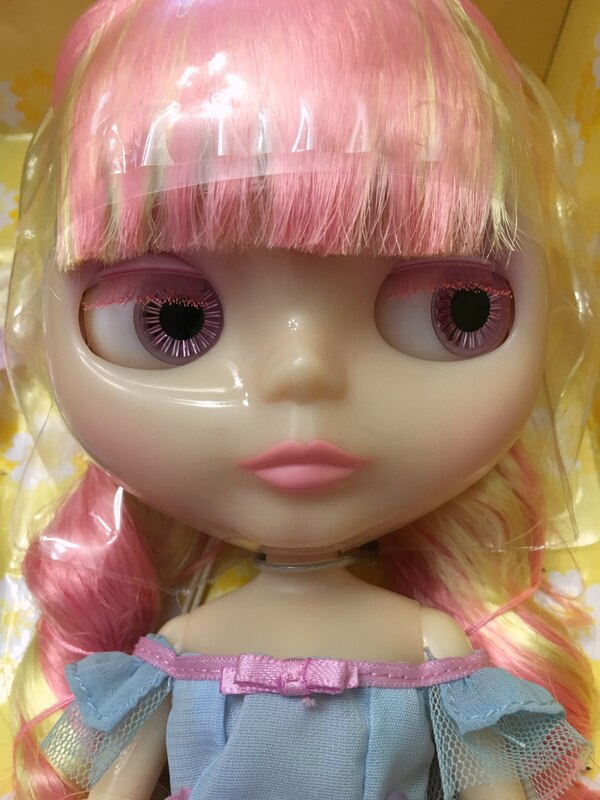 Like Spright Beauty, she also has the Translucent skin. 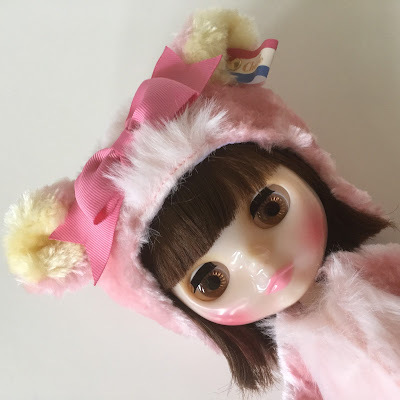 Her cheeks and lips are rosey pink. 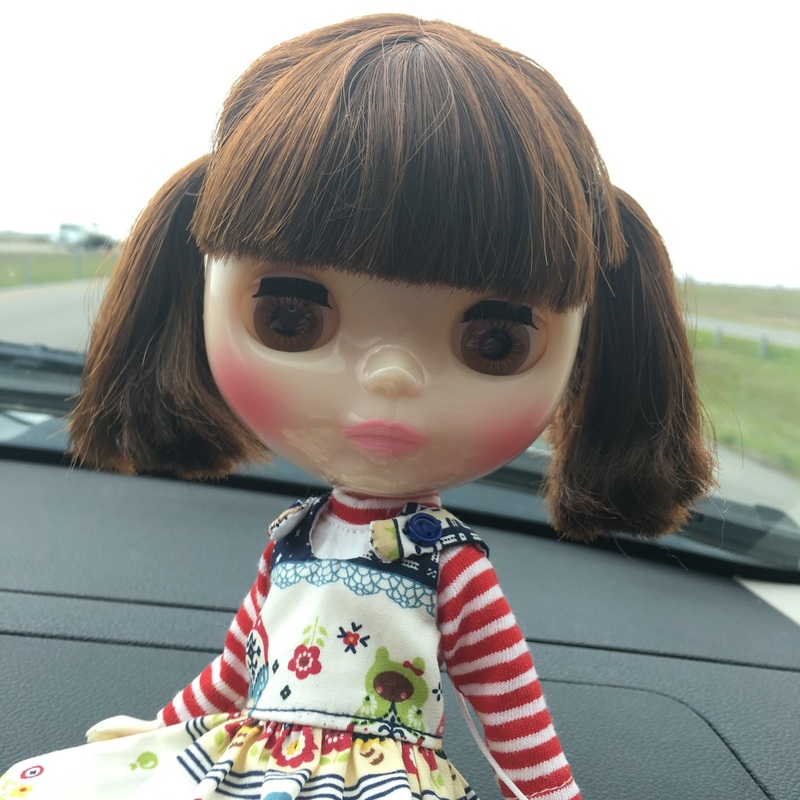 Her brown hair is styled in a short bob with bangs. 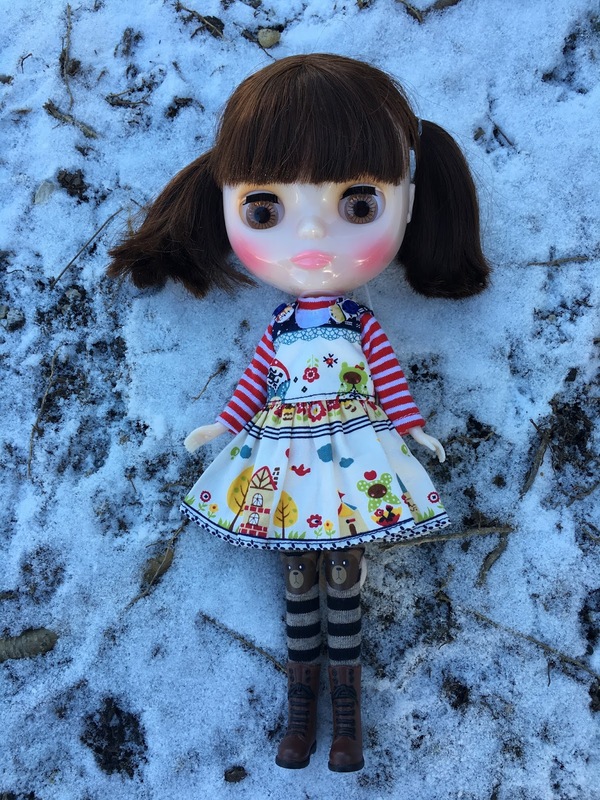 Like all Blythe dolls, her eyes change to 4 different colors with the pull of her string. My favorite of Fable's eye colors are her light brown eye chips. Fable got to come along with us on a road trip to Chicago! It was quite a long drive for us, about 14 hours. 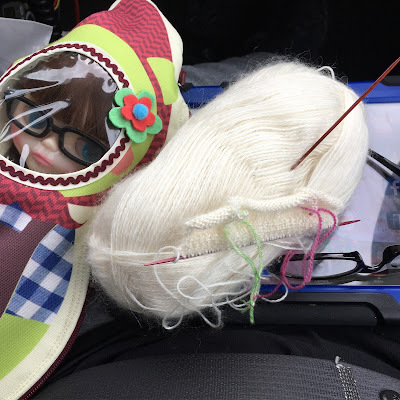 Here she is peeking out from her cute little Gnome travel bag during the ride, while I was knitting. She was wearing her glasses, and if you look closely at the picture, you can see that her glasses were just like mine. 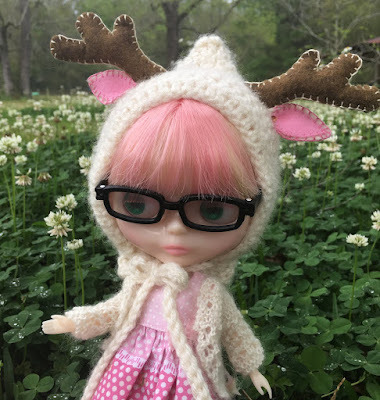 It was April when we went to Chicago, and believe it or not, it was freezing and snowed almost every day that we were there! It rarely snows where we live (maybe once a decade), so we were all amazed by how beautiful the snow was!!! Fawn and Fable were getting ready to make their snow angels here! Here is Fable on the train! 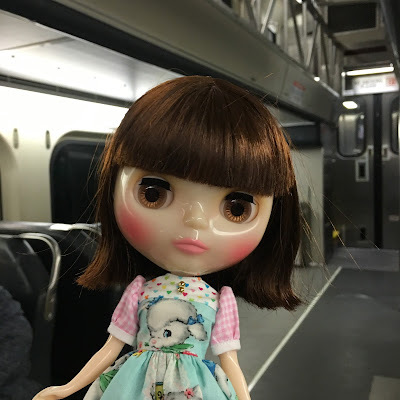 We all loved riding the train! 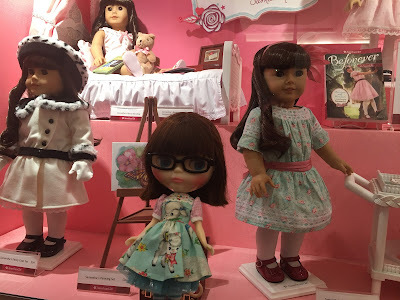 We visited the American Girl Store in Chicago, and Fable was so excited to meet some new friends there! 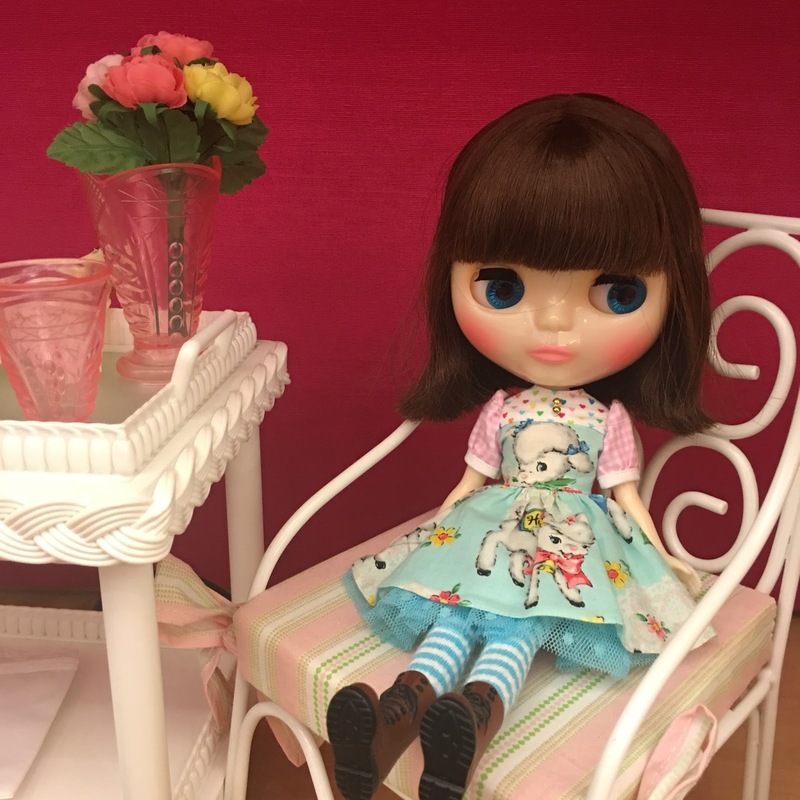 Fable decided to try out one of the American Girl chairs, which she though was quite comfy and adorable! After all of that walking and meeting new friends, she must have been exhausted because she insisted on trying out this bed. 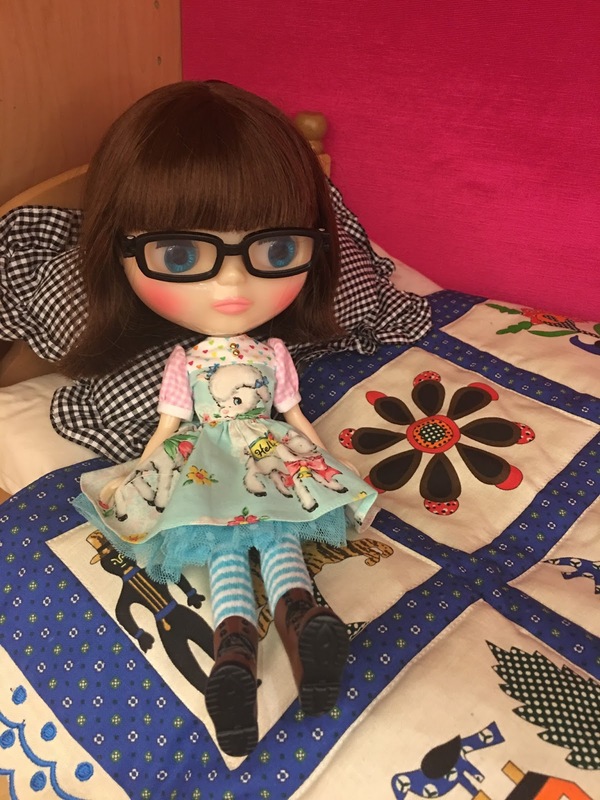 I just loved the quilt. 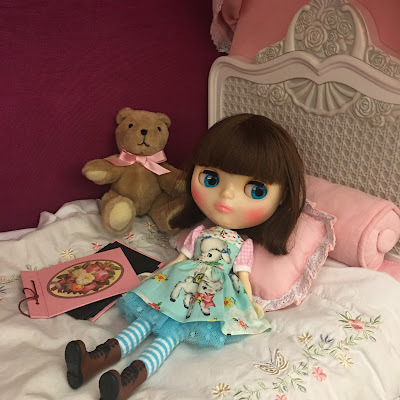 This sweet princess bed was totally precious! Soft pink pillows, beautiful embroidery, a book and a teddy bear... what more could a girl ask for? 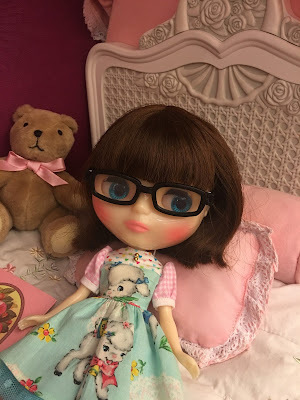 Her glasses, perhaps... so she could read the sweet storybook! 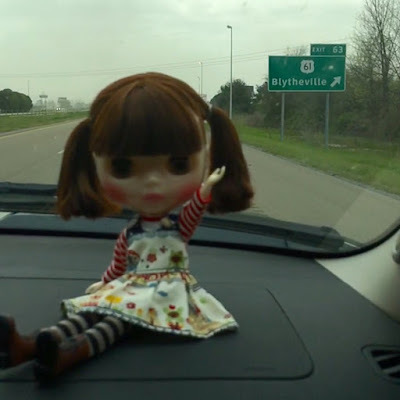 Back on the road, Fable wanted to point out the sign she saw to a place called "Blytheville", as she waves Goodbye! I hope everyone is doing well! I would like to introduce you to my new Blythe doll, Spright Beauty. 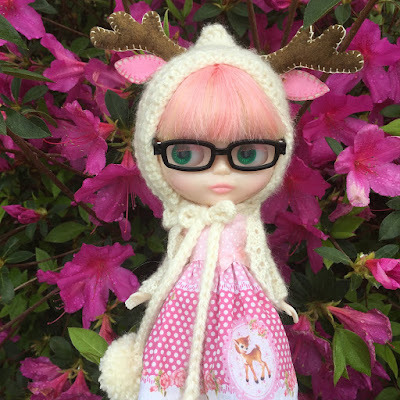 She is an official stock release Blythe. I attempted to make a box opening video, but unfortunately that didn't work out, so here are some pictures from her box opening. 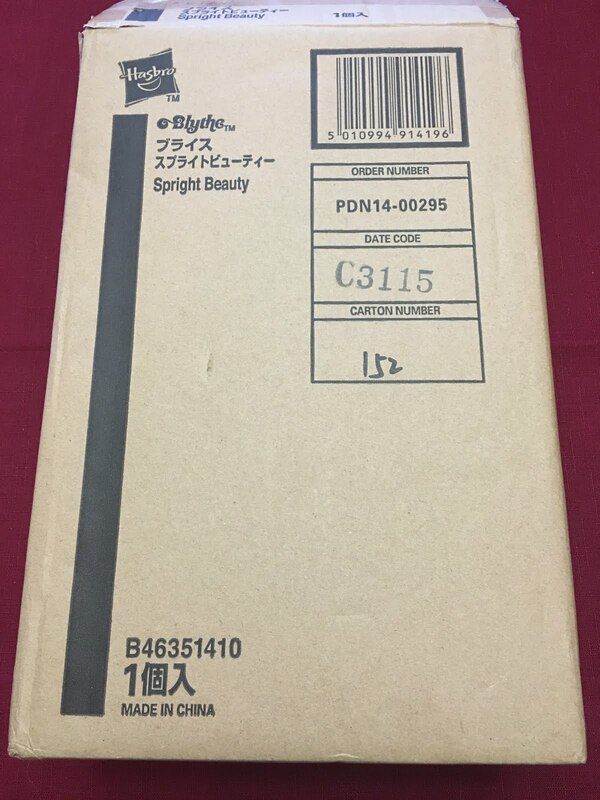 This is the brown shipper carton that her box came in. 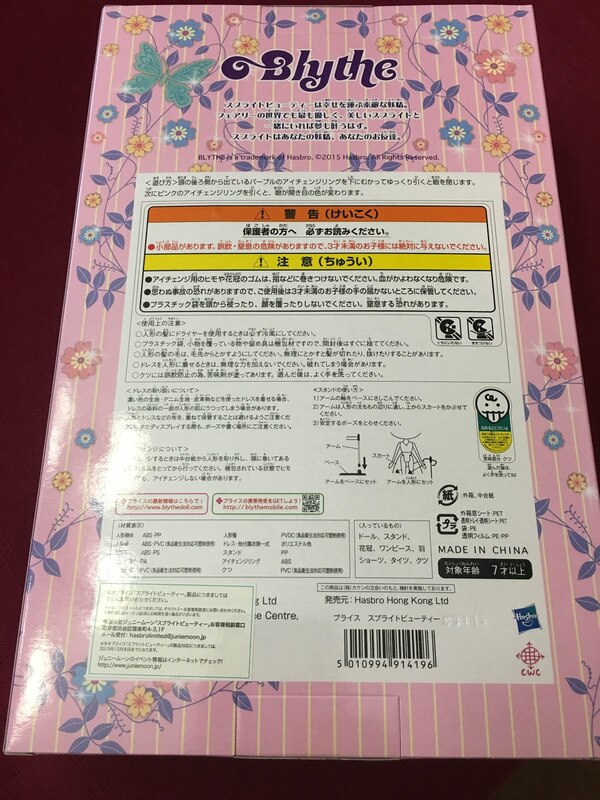 Inside the shipper is a pretty pink box covered in flowers. The back of the box has lots of Japanese writing. 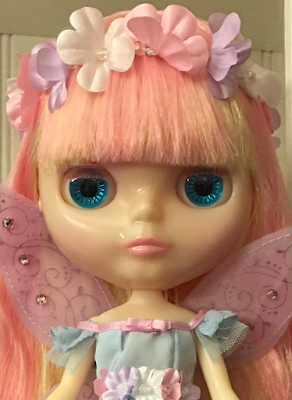 Here's a closeup of her through the window. She was attached to the box liner inside with a wire tie and a bit of string and tape on the back. 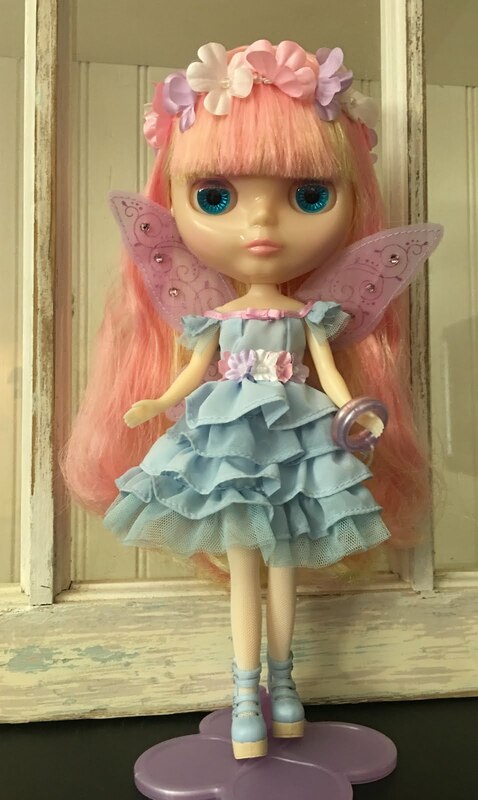 Spright Beauty is a fairy, so she comes with a set of lavender wings that you see attached to the front of her box liner. 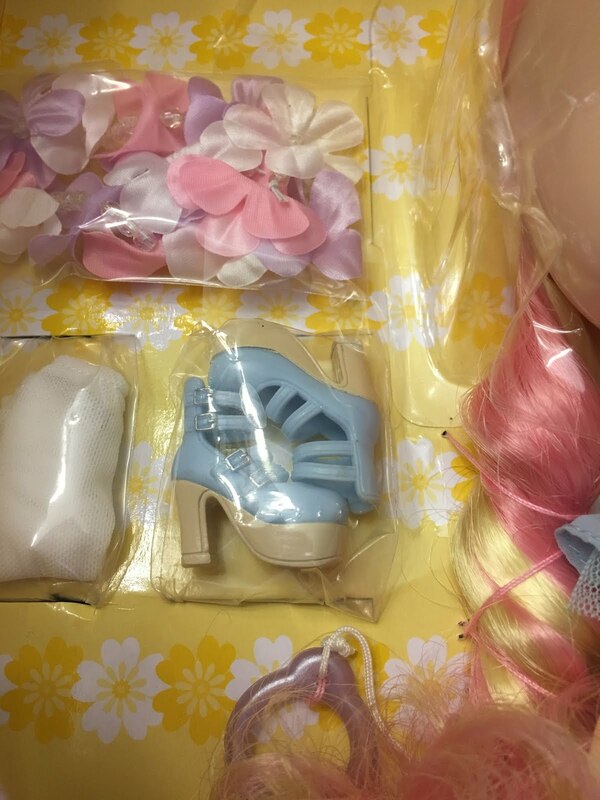 Her other stock accessories include a flower crown, white stockings, blue high heel strappy shoes, and her doll stand. 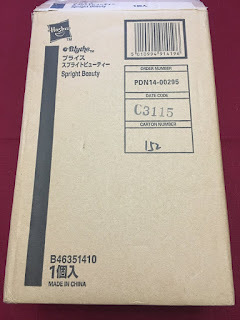 Spright Beauty has the Radiance+ or RBL+ face mold and the special Translucent Cream skin color. 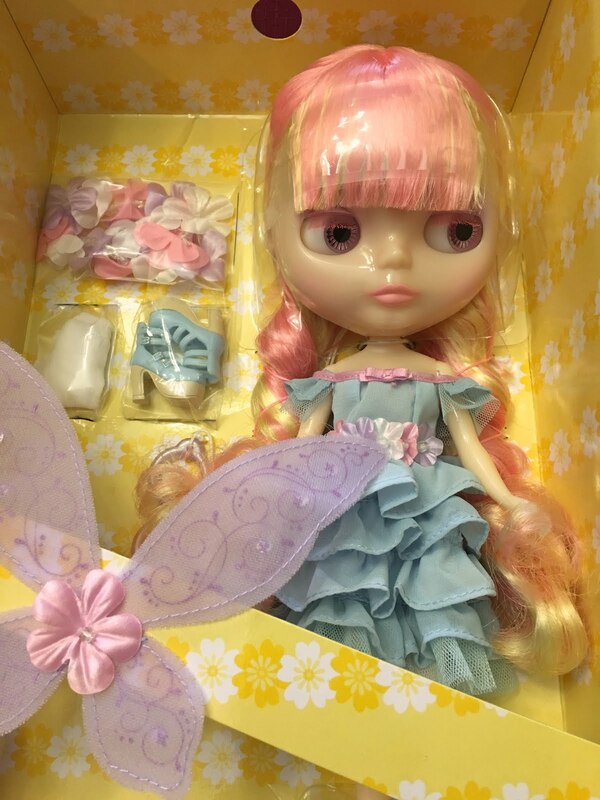 Here she is out of her box and dressed in her full stock. Her dress is light blue chiffon with layers of ruffles. 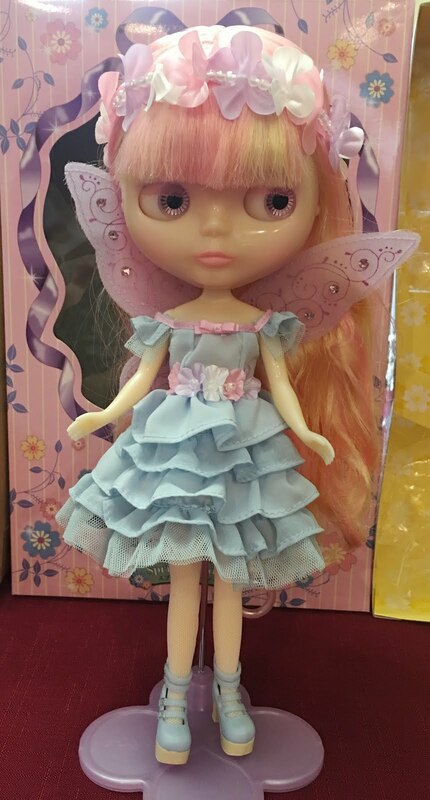 Her wings attach to the back of her dress with a tiny velcro. 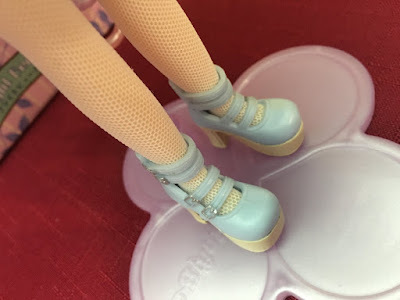 Her shoes are a soft rubbery vinyl and slip right on to her feet easily. The four straps do not actually unbuckle. 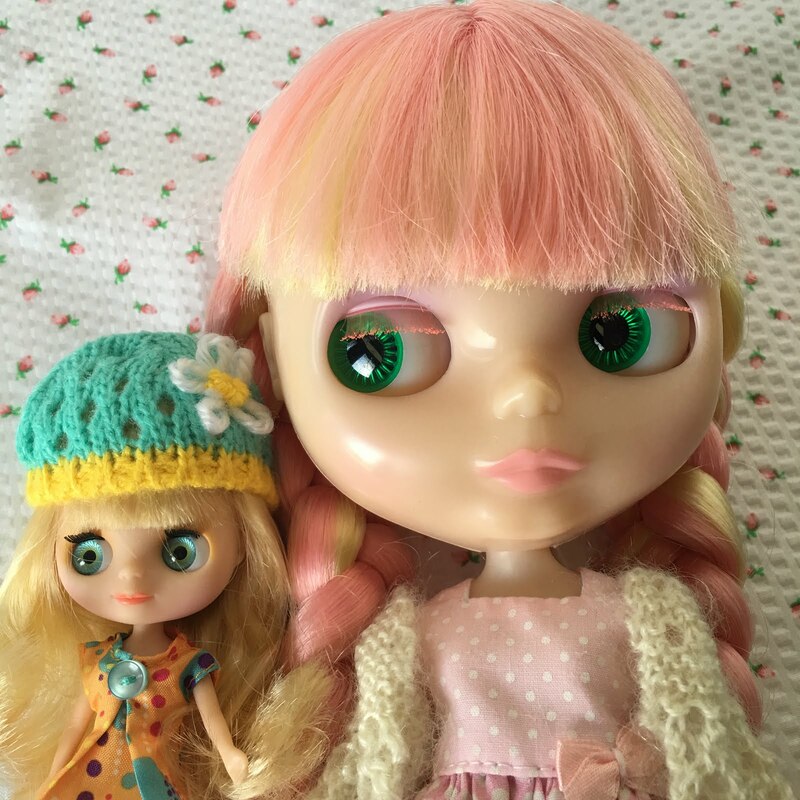 Her hair, which is long with bangs and soft curls, is a very light pink with yellow blonde underneath. Her flower crown is made of pink, lavender and white flowers with tiny sparkly beads in between. One thing that makes Blythe dolls so different and special is their changing eyes. Inside their head is an eye mechanism with four different eye chips. 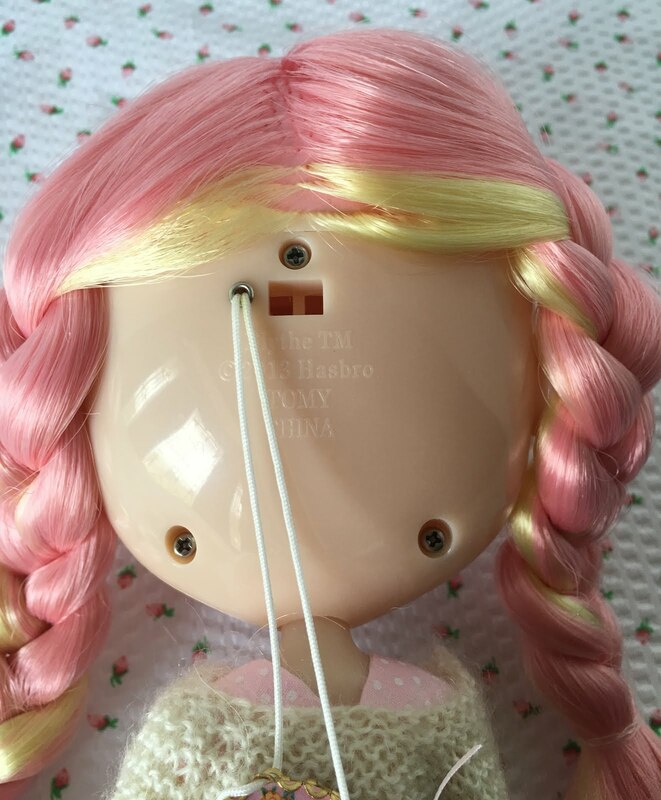 The eye mech is controlled by a string on the back of the dolls head. 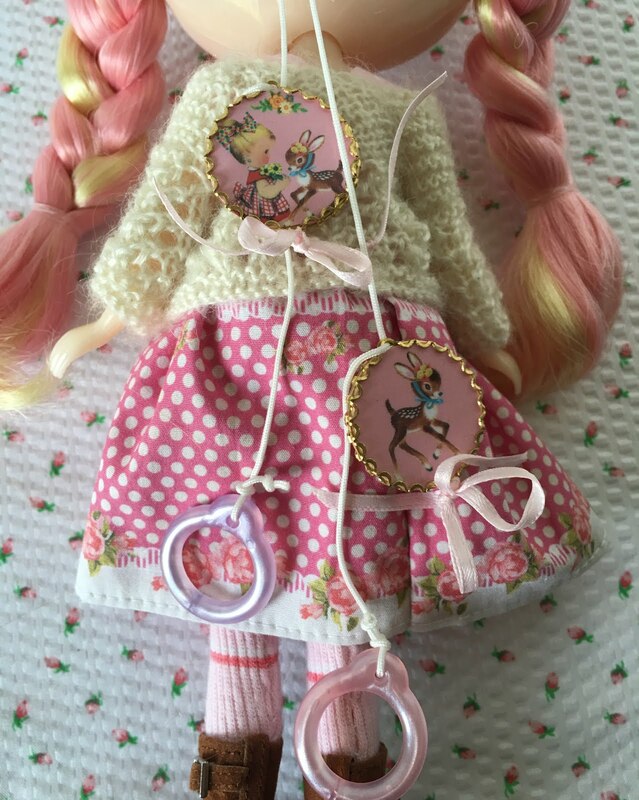 The back of the head is normally covered by their hair, but here I have her hair pulled aside so you can better see the pull strings. There is usually only one pull string, but Spright Beauty was a special release with a sleepy eye feature which will allow her eyes to stay closed. I have added deer charms to her pull strings since she loves deer. Her sleepy eyelids came painted a soft lavender color and her eyelashes are pink to match her hair. 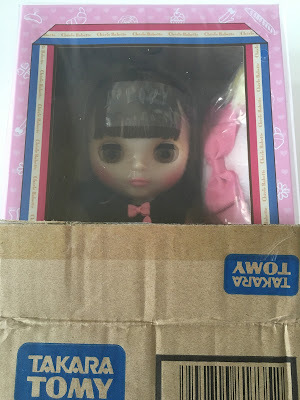 Since my box opening video was lost, I made a quick slideshow to show off her eyes. She has a blue front-facing set, green left-facing set, and two special color sets - brown front-facing and light pink right-facing. I mentioned before that Blythe, with her big head and eyes, reminded me a little of some other dolls, so I have taken some side by side pictures to show the similarities and differences. 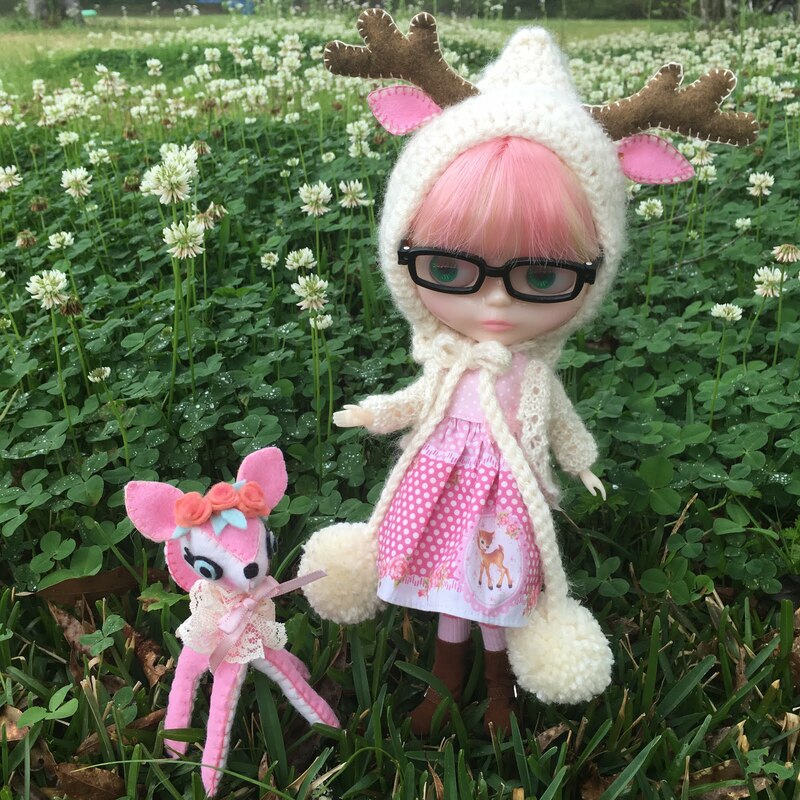 Here is Fawn with one of my tiny Littlest Pet Shop Blythes. The eyes are very different since LPS Blythe's eyes don't close or change. 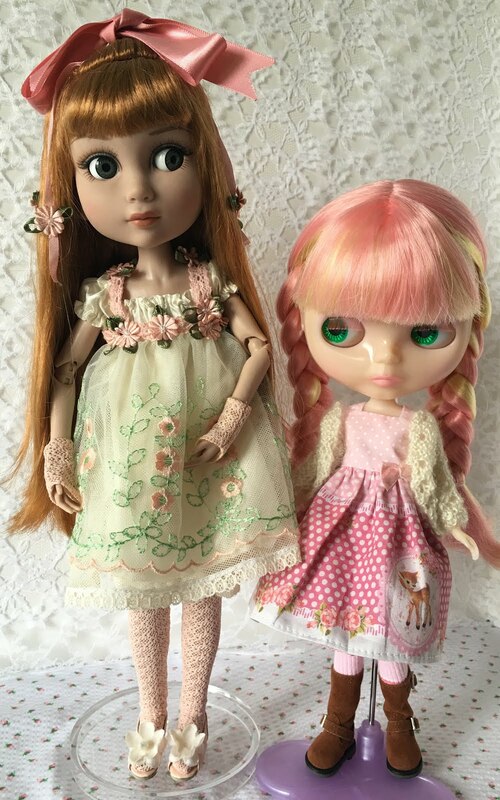 There is a huge size difference between the tiny 4 1/2" tall LPS Blythe and Neo Blythe who is about 12" tall. 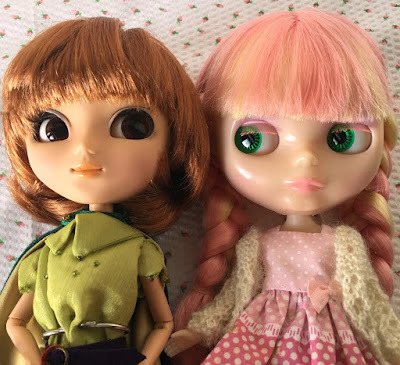 LPS Blythe is closer in size to Takara's Petite Blythe. 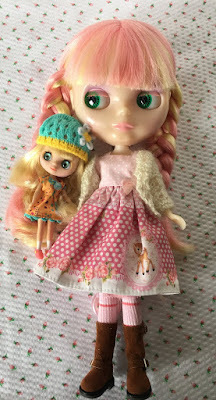 If I get a Petite Blythe someday, I'll do another comparison between her and the LPS Blythe. 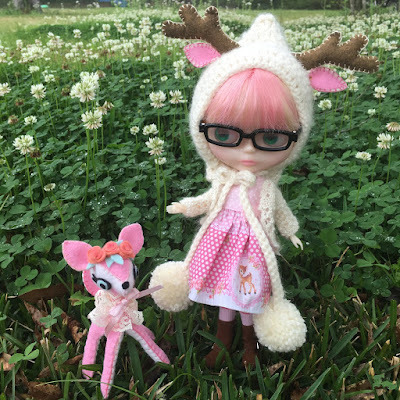 LPS Blythe could be a baby sister or a doll for Neo Blythe. A bit closer to Blythe in size is Ever After High Ashlynn Ella, height-wise anyway. 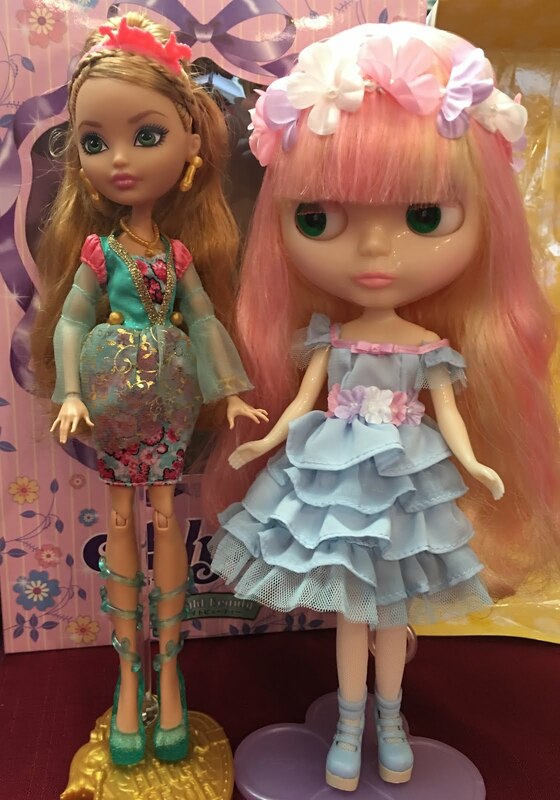 Even though Ever After High and Barbie are about the same size, I chose an EAH doll for comparison, since their heads and eyes are much larger than Barbie's. But as you can see here, her head is still very small compared to Blythe. Another big-head, big-eyed doll is the Pullip, who is actually a little taller than Blythe but with a bit smaller head. 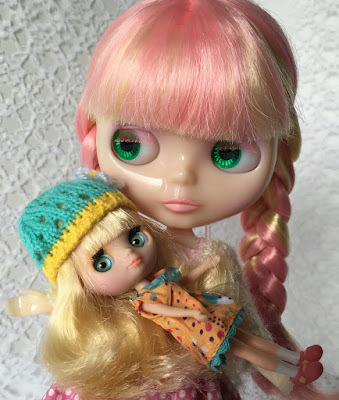 The Pullip body has more joints, but they are considered way more fragile than Blythe. 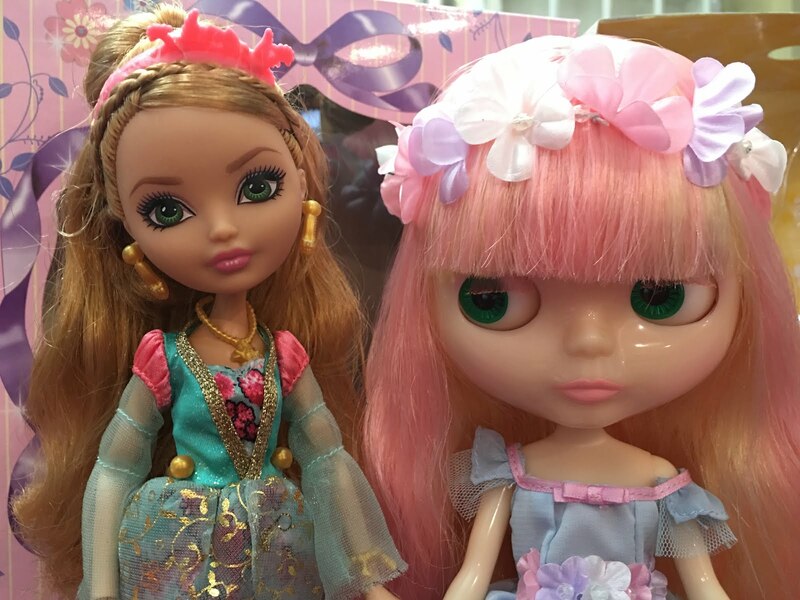 With their heads side by side, you can see the differences in their faces. 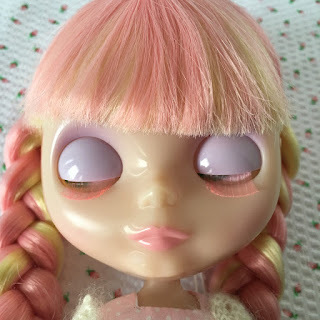 Pullup's eyes do not change colors with a pull string like Blythe. Pullip eyes can only move from side to side and close with a button on the back of the head, but cannot change colors. 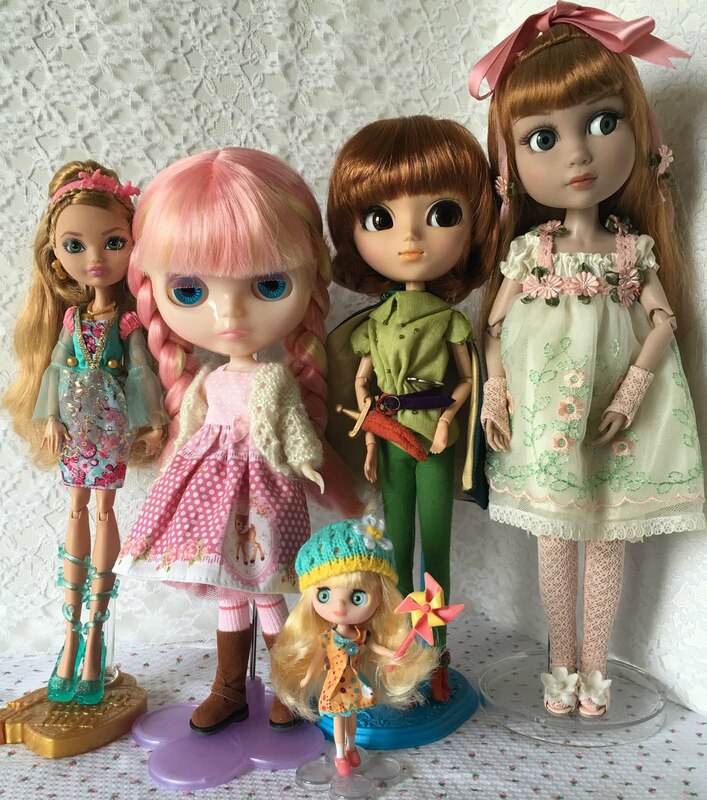 Tonner Wilde Imagination Patience also has a big head and big eyes. 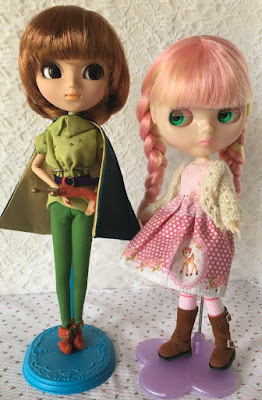 At 14" tall, Patience actually looks much bigger than Blythe, but her head is still not as big. 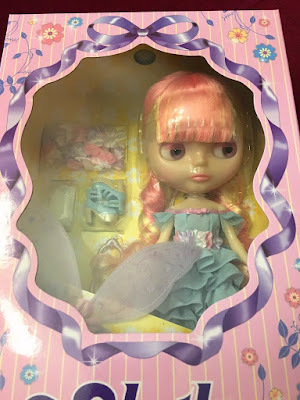 Patience has a very different type of eyes that move from side to side when you move her head, kind of floating back and forth like a Googly doll. Here is a group shot of everyone together for size comparison. 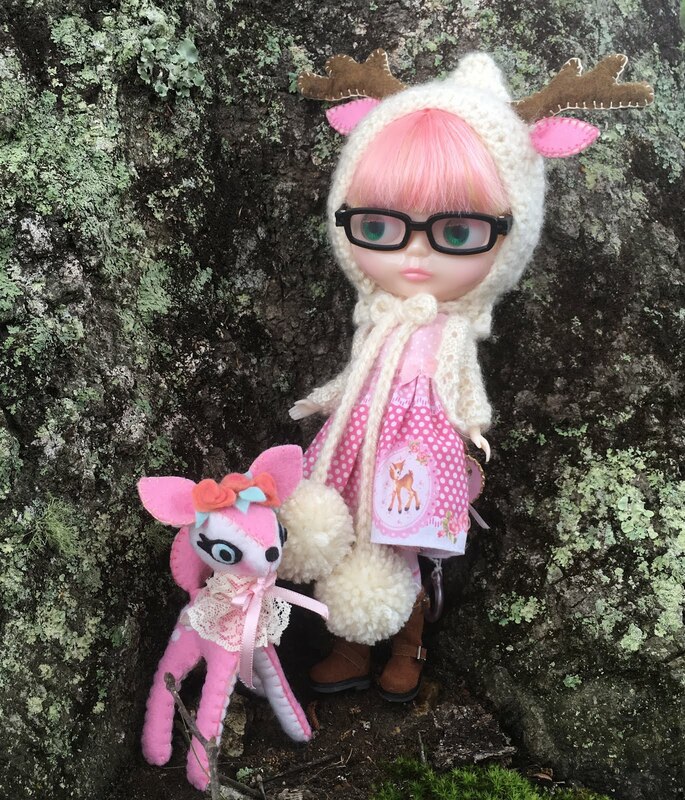 Once outside, Fawn's true forest fairy nature really comes out! 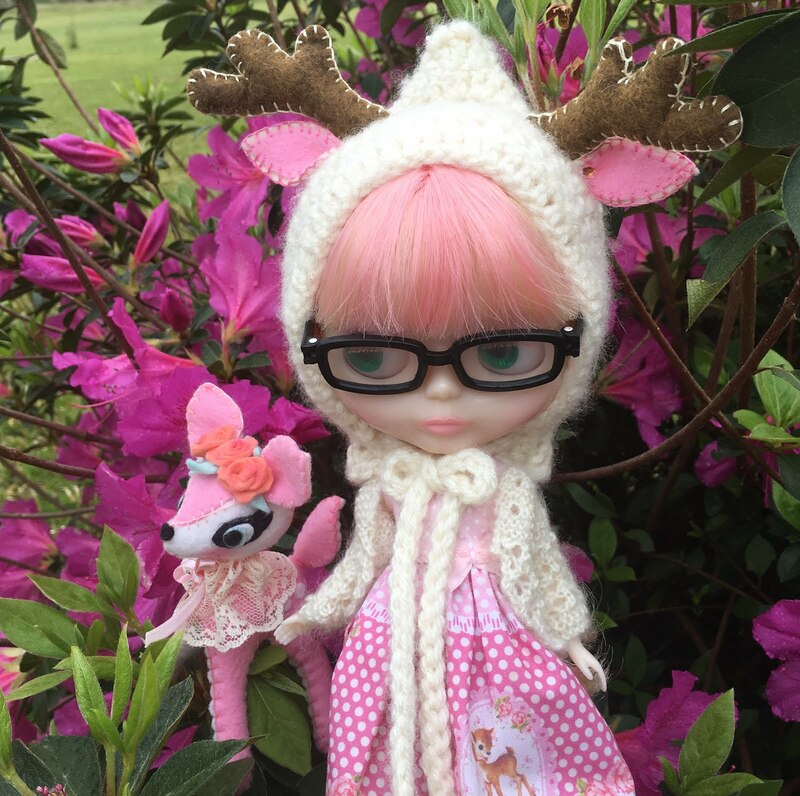 She loves flowers and exploring. I made her very own forest friend, a little deer, who she takes along on all of her adventures. 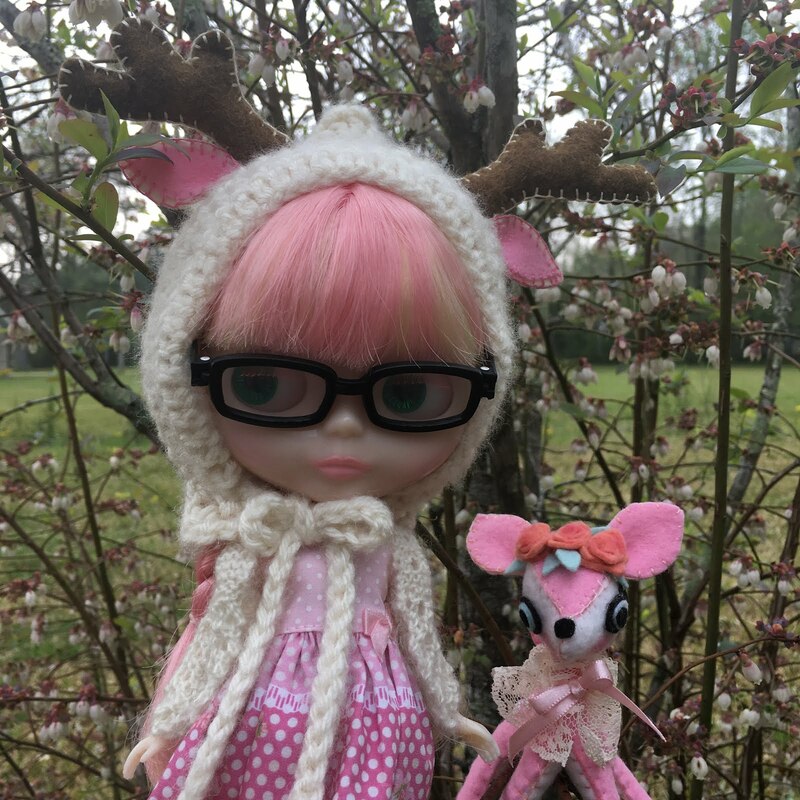 I have thoroughly enjoyed crafting for Blythe! I crocheted her deer hat and knitted her sweater that she's wearing. I have also sewed dresses, socks, and even made some boots. I have lots more Blythe projects planned too! I found the deer dress that she's wearing on Etsy. There are literally thousands of beautiful handmade clothes, shoes, and accessories for Blythe on Etsy. 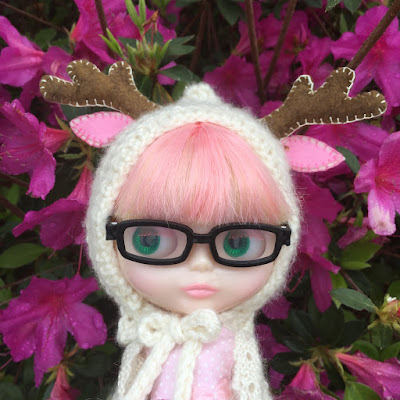 The amazing abundance of adorableness available for Blythe on Etsy and Pinterest is just endless. Crafters can be creative to their hearts content, without ever running out of projects. There are lots of Blythe groups on Facebook with thousands of members sharing pictures and discussions. 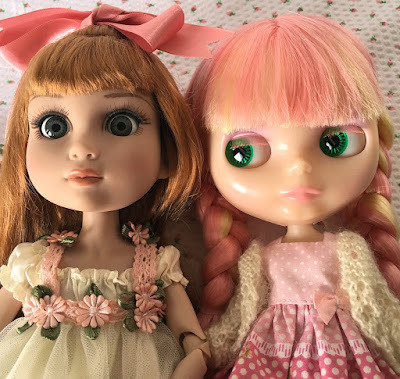 If you're on Instagram, #blythedoll and many other Blythe related tags are shared everyday with lots of inspiring ideas. 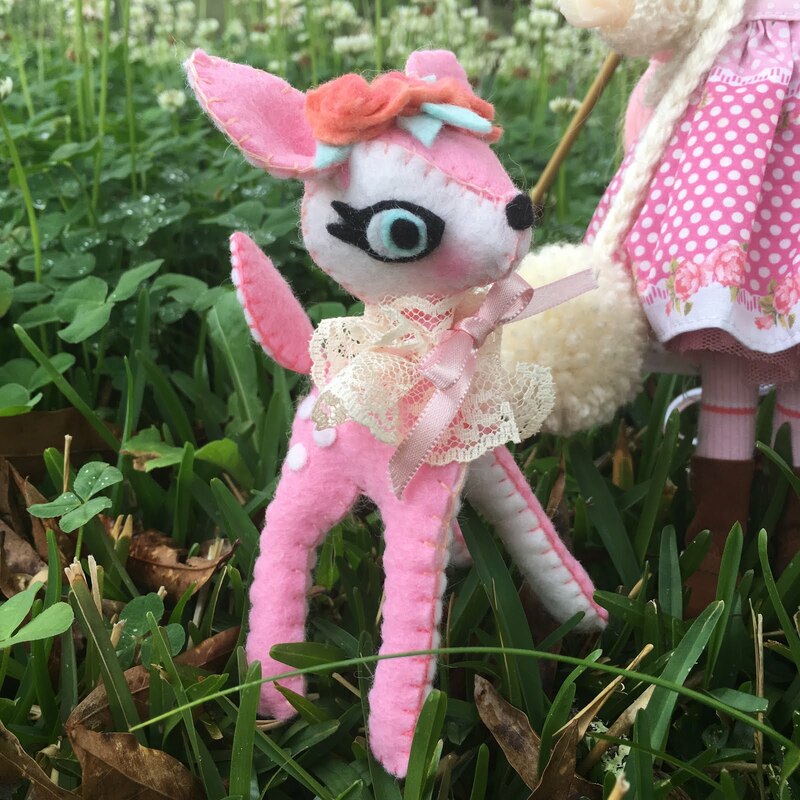 I hope you've enjoyed getting to know Fawn. 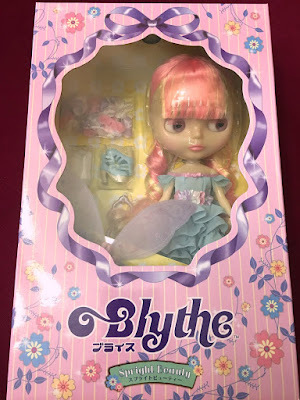 Please leave your comments or questions about Blythe in the comment box below. I'd love to hear from you! More adventures from Fawn and her friends to come. Wishing you a blessed & joyous Easter!